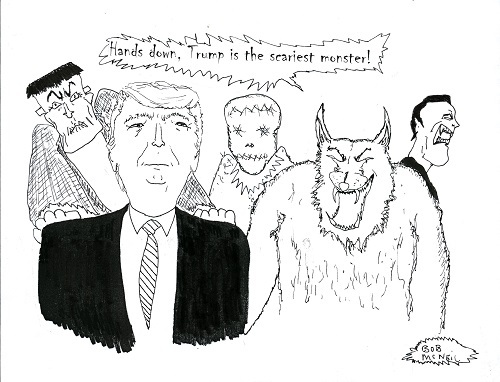 Bob McNeil’s captures in this political cartoon “mood episodes, our president has shown. His narcissistic personality makes him believe that he is superior to everyone around him. The cartoon hopes to create consciousness regarding who our president is. His self-indulgence and boastful exaggerations of his accomplishments, his lack of concern for others, and his impulsive behavior, which can have dire consequences for this nation and our lives. Good job Bob! Wow! This imagery shows the great cataclysm of fear, desperation, sadness, and turmoil that the nation feels right now. The good thing is that nothing lasts forever. Better days are ahead. Great work, Bob!